So there you go, mixer operation up to 80 GHz. 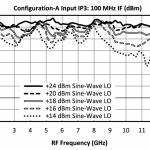 The conversion loss appears pretty high (20 dB) at these frequencies, but remember that we don’t know exactly what the insertion loss of the filter is, the connectors are all only rated to 67 GHz, and this is in a connectorized microstrip package that has its own losses. With all that, the performance of the chip doesn’t look too bad. The predicted CL is actually the measured loss of the MM1-2567LS from the datasheet, so it is there to confirm that our experimental method makes some sense. 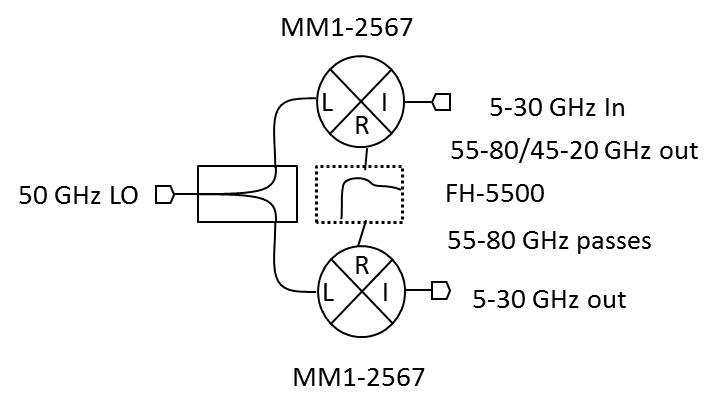 So feel free to buy the MM1-2567LS and try to use it above 67 GHz, just keep in mind that we can’t guarantee the performance since we can’t measure it, so use at your own risk!